We all know that getting your garden landscaped and established can be expensive, very expensive. But it doesn't have to be. You can get most of the things you need and want for your garden free with just a little planning and these handy tips. Freecycle - put a "wanted" ad on Freecycle for plants and you'll be inundated with offers. You can also ask for tools and other garden necessities. One Cheapskates family was able to lay new turf in their freshly landscaped backyard free just by asking on Freecycle. Go to www.freecycle.org to find a group near you. 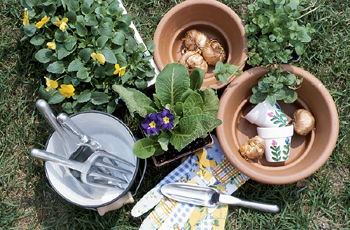 Swap - swap plants and tools with family, friends and neighbours. Just remember when you borrow a tool to return it promptly and in better condition than you received it. Dumpster dive - Ok, I don't mean you actually have to dumpster dive but I've picked up plants, plant stands, plant pots, tables, chairs and garden tools by scouting hard rubbish (always knock on the door and ask if you can take the items, otherwise it is stealing). You'll be amazed at what perfectly good garden equipment people will put out as rubbish.